Karen Blixen’s home lies at the foot of Ngong hills,and is now preserved as a museum.A visit here will expose you to the furniture, artifacts and photographs from her days as a pioneer coffee farmer. Soon after, we drive you to the giraffe center, where families of the rare Rothschild giraffe can be hand fed and photographed from a platform at giraffe’s eye level. There is a restaurant within the center where you can sit for a cup of afternoon tea before returning to the comfort of your hotel room. There was a time not so long ago, when lions freely roamed the streets of Nairobi. 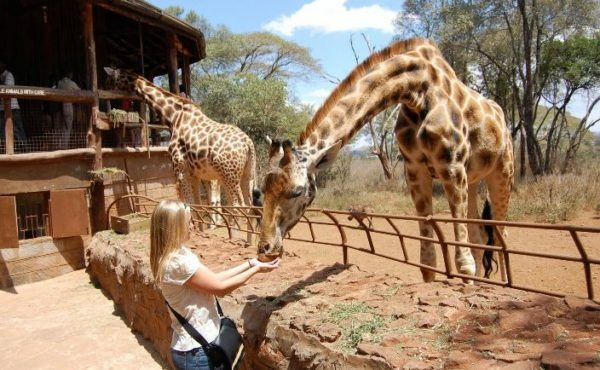 Today they can be seen only 14 kilometres from the city center in the Nairobi National Park. 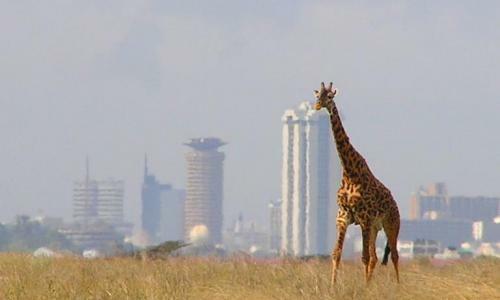 The Nairobi National Park boast of being the only Park in the world with such close proximity to a major city. 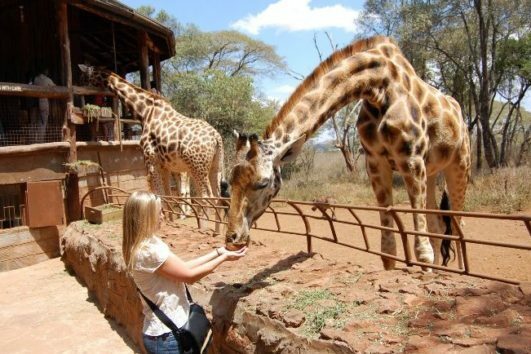 For short term visitors, this park contains most of the animals to be seen on more extended safari such as the rhino, buffalo, cheetah, zebra, giraffe,plenty of antelopes and gazelles. The park is best visited early in the morning and the game drive takes 3 to 4 hours. There after you can opt to enjoy breakfast at the famous Rangers restaurant which is been built overlooking a waterhole that periodically attracts game, treating you to an authentic bush experience. A guided tour of the city of Nairobi (better known as the city in the sun) will generally include the city market; which houses several curio shops. 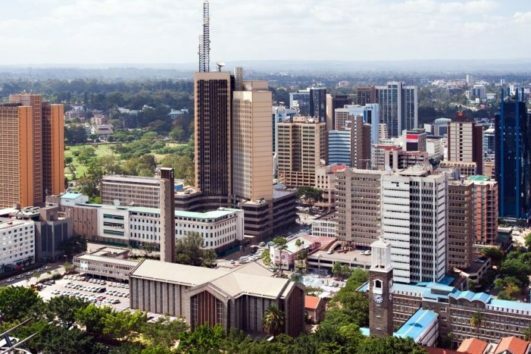 Its surrounding bazaars, a drive past Kenyatta International Conference Center, which was until recently the highest building in the region, the parliament buildings which are adjacent to the late Jomo Kenyatta’s mausoleum, the railways museum and the Nairobi University. For coffee lovers, feel free to ask your guide to show you to one of the many coffee lounges for a cup of pure Kenyan coffee. The tour ends with a visit to the Snake Park and national museum. 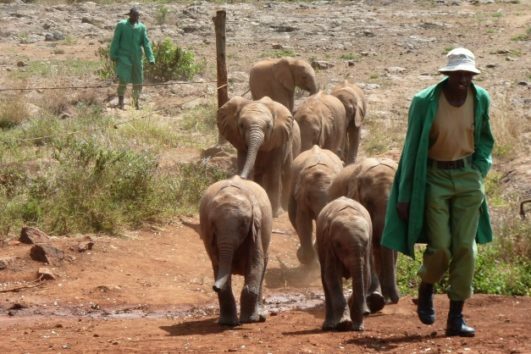 Located at The Nairobi National Park, Daphne Sheldrick’s Elephant Orphanage looks after and supports orphaned baby elephants and rhinos who have lost their mothers to poaching, death, injuries, on getting lost in the wild or other tragedies. Besides feeding, washing and walking the babies, Daphne and her dedicated staff of keepers provide emotional support to the orphans as they raise them to be released back into the wild when they are ready. It is worth a visit to the park to see the young elephants interacting with their keepers – playing, taking mud baths and being fed with milk. This is a rare sight to watch and a most memorable way to get up close to the babies and observe their playful habits, something which is not possible or even safe during your safari in the wild.